Understanding How Pension Fits into the Scheme of Things at VA.
Pension (aid and attendance benefit) and its sister benefit, Compensation, are two disability income programs available to veterans. Compensation is the more heavily used benefit and is available to veterans who have service-connected disabilities. VA estimates about 35% of all currently discharging veterans will apply for Compensation some time during their lives. Pension is a lesser used benefit and a lesser known disability income that is available to veterans who served during a period of war. Pension is available to war veterans who are non-service-connected disabled or age 65 and older. Special death benefit arrangements related to these two disability programs are also available to surviving dependents of veterans. 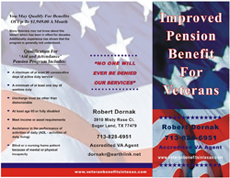 Claims for Compensation and Pension are submitted on the same application form and VA can grant either one. Generally, Compensation is the more desirable benefit because there is no income or asset test and it is not taxable as income. Pension works best for veteran households with very low income who do not qualify for Compensation. Pension also fits well for veteran households incurring the high costs of long term care services and in these cases may be a better alternative to Compensation. In terms of number of employees, the Department of Veterans Affairs is the second largest federal agency, employing over 218,000 full-time workers. The Secretary of Veterans Affairs is a member of the President's Cabinet. There are also numerous other administrative and support divisions in the Department of Veterans Affairs devoted to supporting the 8 legislated benefit programs available to veterans. These benefit programs are listed in the table below. The National Cemetery Administration with 1,582 employees and an annual budget of $167 million is the smallest division of VA. It oversees cemeteries for veterans and the grave marker program. Veterans Health Administration -- another division of Veterans Affairs -- is the largest single provider of integrated health care in the United States . With a little over 197,000 employees, it serves 5,819,200 patients providing comprehensive medical care which also includes prescription drugs, long-term care services, counseling, prosthetics and orthotics, hearing clinics, vision clinics and limited dental services and eyeglasses for a select number of veterans. Not all veterans can get into the health care system because of funding limitations, and Veterans Health is now limited to income means-tested veterans and veterans with service-connected disabilities. Veterans health care has in recent years been cited by the media as being the best health care service in America , based on treatment outcome and patient satisfaction. The Veterans Benefits Administration -- the third division of Veterans Affairs -- manages the Compensation and Pension programs, tuition assistance for veterans and reservists, vocational rehabilitation and employment services, VA guaranteed housing loans and stipends for certain veterans for burial and grave markers. VBA also administers six life insurance plans for certain veteran, reservist and active-duty service groups and oversees two additional life insurance plans administered by The Prudential Insurance Company. The Department of Veterans Affairs owns 30,217 acres of land and 5,558 buildings; operates 155 hospitals, 717 ambulatory care and community-based outpatient clinics, 133 nursing homes, 206 community-based outpatient psychiatric clinics, 57 regional benefits offices, and 120 national cemeteries. Below is the 2008 proposed budget for the three divisions: VHA (Veterans Health Administration), VBA (Veterans Benefits Administration) and NCA (National Cemetery Administration). Administration and support is also included in the pie chart. The VBA administers its benefit programs through 57 regional offices located in 49 states (Wyoming is not included), the District of Columbia , Puerto Rico and the Philippines . Each state-- except Wyoming -- has a least one regional office but California has three RO's and Texas , Pennsylvania and New York each have two offices. Compensation, Pension and burial benefits are managed out of each of the 57 offices for the territory in which the office is located. With the exceptions of the larger states mentioned above, the territory of each regional office is the state in which it is located. States with more than one regional office serve specified geographic areas in that state. Life insurance is managed out of the Philadelphia office and loan guarantees are headquartered out of nine designated regional offices. Pension Eligibility Verification Reports (EVR's) and income matching for Pension are administered in the St. Paul , Philadelphia and Milwaukee regional offices. VA is proposing to move all Pension applications to these three Pension administration offices sometime in the future and to put much of the annual reporting and application procedures for Pension on the Internet for online input. Whether this is a positive or negative move for Pension applications is not known at this point. It is clear from the chart above that the Compensation and Pension function in regional offices consumes about 92% of the budget for VBA and its regional operations. These two programs also utilize most of the staff as well. Out of a projected 2008 number of 13,065 employees in the regional offices, 9,559 workers -- 74% of the total -- will be dedicated to Compensation and Pension. Compensation, by itself, uses about 84.2% of the manpower devoted to Compensation and Pension Activities -- about 8,000 employees. In 2008, VA expects to process about 720,000 actions related to Compensation. Of these, about 248,000 are expected to be first-time claims and about 448,000 or 52%, are expected to be claims reopened for consideration of additional benefit. In 2008, VA expects to process a little over 400,000 actions related to Pension. Of these, about 91,500 are expected to be first-time claims for Pension or Death Pension. About 48,000 actions are expected to be Pension cases reopened for consideration. From the statistics we can infer that first-time Compensation claims are expected to be about 2 1/2 times the number of first-time Pension claims. Compensation cases reopened for new consideration are expected to be about 10 times the number of Pension cases reopened. VA estimates its service representatives, in the regional offices, process on average about 100 applications for Pension a year for each employee assigned to the Pension activity. In 2008, VA expects 2,879,329 veterans to be receiving an average Compensation rate of $11,258 a year for a total of $32,416,448,000. VA expects 340,702 survivors of veterans to be receiving yearly average death Compensation-related benefits of $13,695 for a total of $4,667,027,000. In 2008, VA expects 320,378 veterans to be receiving an average yearly Pension benefit of $8,999 for a total benefit of $2,883,170,000. VA expects in 2008 to be paying 192,656 survivors a Death Pension benefit average of $4,619 a year for a total of $889,971,000. Applications for first-time Pension claims are mailed to the regional office of the State in which the claimant resides. For those States with more than one regional office, the claimant must find out which area the office serves and mail the application to the appropriate regional office. Upon receiving an original application for claim in the office, workers will date-stamp the document and send a verification letter back to the person making application. This date becomes the effective date of the claim. If an award is granted, retroactive payments are made back to the first of the month following the month of the effective date. After making copies of and certifying the original discharge papers, these papers will also be sent back to the applicant. VA has divided the application process into an assembly line where each function along the line has a responsibility for acquiring information, documentation and follow-up for additional information. When a claim is fully developed for a rating decision -- which is required with many Pension claims -- it is sent to the Rating Team for a final decision. Finally, the claim is handed off to a post determination team that handles final notifications, arrangements for payment and so on. This assembly-line system requires the handling of claims folders many times by a number of people and it is not an efficient way to process claims. Veterans Service Representatives spend a great deal of time trying to match documents that come in the mail with the appropriate folder. According to reports from applicants, It is common for VA to request documents that have already been submitted. VA, on the other hand, asserts this is an efficient system but not in time-of-handling but in the costs involved in the process. A case management system where only one person handles the claim from inception to award or denial is much more efficient for time-in-process but would be extremely costly and cumbersome to VA. Rating Veterans Service Representatives, near the end of the chain, require extensive training and knowledge in order to make accurate award decisions for claims. Making all VSR's case managers would require extensive training and higher salaries to acquire the expertise as a Rating VSR. By using the assembly line, VA can use cheaper workers with much less training to prepare claims for the final decision made by the rating activity. A paperless process would also be extremely beneficial and much more efficient, even with the assembly line, but that would require a costly and disruptive effort by VA to convert. There are over 300,000 claims left in process at the end of each year and any glitch in the current system would only increase that backlog. Also, being a federal agency and relying on Congress for funding typically means chronic underfunding for desired projects. There is never enough money to do it right. In 2006, VA reported that the average Compensation/Pension claim required 177 days for approval or denial -- almost 6 months. This was the average or "mean." The "median" -- the point halfway between equal numbers of claims in process versus claims approved -- was 154 days. When the mean is larger than the median this means some cases are going much longer than 177 days, thus distorting the average number towards the higher-end. Some claimants report waiting more than a year or two for a final decision. VA has pledged in 2008 to reduce the average claims time for applications requiring a rating to 145 days. This is still almost 5 months while awaiting a decision. The Rating Team’s primary function is to make a determination on claims that have been developed to such an extent that a rating decision can be attempted. A Veterans Service Representative who has been trained to do ratings is competent to determine disability levels based on medical information from doctors records or reports. For Compensation claims, this expertise requires determining a level of disability such as 10% disabled or 30% disabled or so on. The majority of Compensation claims require a determination of disability. DIC claims may not require a rating depending on how the veteran died. Claims for Pension require the rating activity to determine initial eligibility for veterans younger than 65 based on the requirement for total disability. A Rating VSR must also determine from medical information whether there is an additional need for aid and attendance or if the claimant is housebound. Finally, the rating activity for Pension must determine whether the level of household assets might disqualify a claim. Not all applications for Pension require a rating. When the term "rating" as used in conjunction with Pension, it can mean two things. Rating can mean that the claim was awarded or denied based on a decision by the Rating Team in the regional office. Rating can also mean that an additional allowance for aid and attendance or housebound was awarded. These allowances are often called "ratings." A so-called "triage" team in the regional office examines all original claims for accuracy and completeness of information. If the claim is unsigned or if important boxes are left blank, these deficiencies are marked in red and the application form is sent back requiring resubmission. If discharge papers are not included, this could slow down the process by possibly two months. If a proper VA power of attorney has not been prepared, another two months might go by while awaiting the proper document. Triage team members are looking for a claim that is "substantially complete." Claims that seem to have all the requirements are passed on to the Pre-Determination Team. This team determines the need for additional documentation in order to prepare the claim for a rating if a rating is necessary. If a rating is not necessary, a final decision could be made at this point. If the claimant is accurate in filling out the form, in providing proper discharge papers and proof of relationship, and in providing the proper VA power of attorney or guardianship proof, the initial claim is well on its way to being approved more quickly. Another important issue in submitting a well-documented claim is knowing, in advance, what evidence and documents are required for a rating decision. By providing those documents upfront and not waiting for VA to come back with a request, the claim can be passed by the triage team immediately to the rating activity for a final decision. This might cut the time for a decision to two or three months. The secret to shortening the time from submission to a decision is to anticipate all of the documentation requirements that are necessary and submit them with the original application. There is no look back penalty when assets have been properly transferred or converted to income prior to applying to VA for pension. However, with Medicaid, there is a penalty assessed if within five years after modifying the asset, application is made for Medicaid. It is therefore extremely important to consider future Medicaid eligibility (i.e. when a need for nursing home care arises) when transferring assets or converting assets to income when applying for pension.